After I sold off my GTX750Ti, I was looking for a new video card for my TV-based T430s. The HD4000 was doing just fine with my ancient 32" 720p TV, but I finally purchased a new television, which made a 4K output quite a bit more important. After deliberations, I've decided against mutilating my second Thunder2, and I went for the most powerful option available to me that does not require a modding of the enclosure, or a bigger power supply (I still have my DA-2 with my custom cabling, but in this case I went for pure elegance and simplicity over performance - After all, this is sitting in the living room). The 3840x2160 TV also means that I can easily run an upscaled 1920x1080 resolution in the case I want to play here, for which the 1050Ti is well suited. With the 15% off for new customers at Jet.com, the 1050Ti was 118$ shipped, which made it a relatively attractive option in general. My additional plan was to run a performance comparison with this 1050Ti between the EC connection via a PE4C v2.1 and the Thunderbolt1 link, but that was not to be. Windows 10 simply refuses to detect the 1050Ti over Expresscard (this worked just fine with the older 750Ti). I wonder if my PE4C is starting to be unreliable due to its age and disuse, but in any case, I cannot do the planned comparisons. Which is a damn bummer, as I was quite interested in the results, not only for the EC vs TB1 comparison, but also because I wanted to know if x1.2Opt is still a possibility in the modern age. Regardless, we'll have to do without. I don't have the inclination to spend a long time to debug an EC setup I do not really plan to use. CPU: Core i7 3520M, 2.8Ghz, 3.6Ghz Turbo. eGPU: Gigabyte GTX 1050Ti 4GB. Screen: Sony XBR-43X800D TV (3840x2160 over HDMI2.0). As with my previous T430s-based setups, this setup is as plug-and-play as it gets: Install the video card into the Thunder2, hook up the Thunderbolt cable to the laptop, connect an upgraded power brick to the enclosure, and power up the machine. No Code12 (or other) issues occurred and the latest nVidia driver (378.49) installs without any problems. Windows 10 and the nVidia driver allow to eject the eGPU via the nVidia GPU Activity tool residing in the system tray. Overall, this setup is entirely hassle free. Crysis (the original) at 1080p, Very High settings with 2xAA runs at 40-50fps (Considering a decade ago I could barely max it out with two 8800GT cards in SLI: How has technology advanced...). Stellaris runs maxed out at 3840x2160 with 2xAA at 50-55fps. Here are some results of this setup, for reference, and specifically to try and quantify the Thunderbolt1 bottleneck. Cloud Gate 1.1: 10,062, with 24,240 graphics score. A desktop i3-3220 + GTX1050ti combo achieves 12,097, with a 51,727 graphics score. Sky Diver 1.0: 11,346, with 15,730 graphics score. A desktop i3-3220 + GTX1050Ti combo achieves 14,096, with a 25,681 graphics score. Fire Strike 1.1: 4,855, with 5,879 graphics score. A desktop i3-3220 + GTX1050Ti combo achieves 5,837, with a 7,727 graphics score. Time Spy 1.0: 1,918, with 1,975 graphics score. A desktop i3-3220 + GTX1050Ti combo achieves 2,207, with a 2,339 graphics score. EDIT: Adding a table for better readability. The CPU-related scores are close, so the comparison between the mobile Core i7-3520M and the desktop i3-3220 is apt. The GPU scores show a massive bottleneck at the high-fps tests: Cloud Gate and Sky Diver show a 53.1% and a 38.7% reduction in performance, respectively. Since the CPU performance is all but identical, and I chose desktop results using a similarly clocked GTX1050Ti as I am using in the Thunder2, the reduction has to be caused by the connection type between video card and host system. In other words, this is a Thunderbolt1 bottleneck right here. That said, the frame-rate in both tests is very high, with Sky Diver exceeding 70 fps even on the Thunderbolt1 link, and Cloud Gate exceeding 90 fps. If we look at Time Spy, on the other hand, we only see a 15.5% drop in performance compared to the desktop. Confirming our hypothesis that the connection bottleneck diminishes as the frame-rate drops. Conclusion: Thunderbolt1 (and lesser) eGPU links are not tenable for high FPS gaming, but can still serve decently at lower FPS. 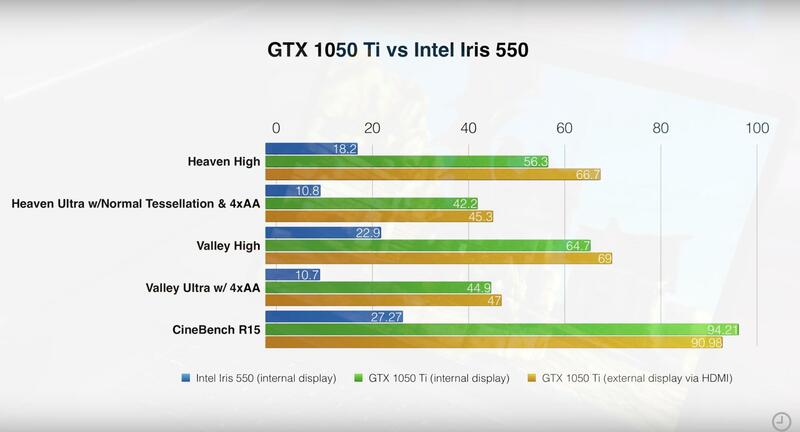 In other words, if you're stuck with these, don't aim over 60fps - try to match an eGPU and a monitor that would be expected to give you around 60 fps if they were in a desktop. Getting a GTX1080 with the goal of running a 144hz monitor is not going to work on TB1. A similar test with a Thunderbolt2 laptop and a R9 Fury can be found here. I was asked on Reddit to test these results on the internal monitor, so I re-ran these benchmarks using the 1600x900 internal display. All benchmarks were executed with default settings and the output was downscaled (and in the case of Cloud Gate - Upscaled) for display back to the internal monitor. The external monitor was simply disconnected. It is obvious that in the case of very low FPS, there is no performance loss over Thunderbolt1 with a 1600x900 internal display. Why does the internal display resolution matter? Well, the display resolution comes may come into play because while the eGPU is rendering at a higher resolution, the question is where is the image downscaled? If in the eGPU, then the pixel data being sent back to the laptop is based on a 1600x900 resolution. If by the iGPU, then the image data being sent is before downscaling, and thus larger (the default test setting range from the 720p Cloud Gate, through the 1080p Sky Diver and Fire Strike and finally the 1440p Time Spy). In any case, even if it is downscaled on the eGPU, a higher internal resolution would still force a higher utilization of the Thunderbolt1 link. It is also obvious that 30-ish FPS should not a problem for Thunderbolt1, either. So a Thunderbolt1 eGPU can reliably deliver console-like performance (Allow me a small PCMasterRace gloat: LOL!). This conclusion stems from both of the heavier tests, as the results effectively did not change from the external monitor case (Time Spy actually scored higher on the internal, but I am willing to dismiss a <3% difference as a statistical anomaly, and if we ran the same test 100 times such a difference between runs would not stand out as strange). The two lighter tests are capped at the internal screen's refresh rate by Optimus, leading to the larger loss of "performance" in the case of the lighter Cloud Gate test. In reality, though, a higher performance here would not really matter due to forced v-sync nature of Optimus. It is interesting to see that in both these cases, 60 FPS was doable. Sky Diver is rendered in 1080p by default, so even if the downscaling to 1600x900 is done on the eGPU, we would still need to be sending an 1600x900 image 60 times a second to display it. 1,600 x 900 x 60 = 86,400,000. 86,400,000 x 24 = 2,073,600,000 bits per second. Well below the 8,000,000,000 bits per second (in each direction!) that Thunderbolt1 is capable of (10Gbps with 8/10b encoding means an effective data rate of 8Gbps). It is not surprising that 60 fps on the internal was thus doable at 1600x900. 1080p at 24bpp, 60hz (2.98Gbps) and even 1440p at 24bpp, 60hz (5.3Gbps) would still be under the capacity of the Thunderbolt1 link. We would need to reach 4K resolutions (2160p requires 11.9Gbps) to actually saturate it (and 4K is still below the 16Gbps effective bandwidth of Thunderbolt2, so it should be doable there). It should be noted that at times the rendering process requires data to be copied back to the laptop, which would consume some of the return bandwidth as well, but 1600x900 is barely 25% of the link width of Thunderbolt1. But honestly, this raises more questions than answers: Where is the internal monitor performance hit that we're been treating as gospel?! It is not a myth, if only for the fact that people have indeed shown it to happen in Youtube videos! What's going on here, and is this specific to the T430s? EDIT: I have also run these tests with the Heaven and Valley benchmarks as well. The results are pretty much the same. Aside of the internal monitor being locked to 60-ish FPS and the eGPU not rendering the extra frames, the performance is pretty much identical. I specifically used settings that would lower FPS to under 60 or close to it, because FPS over 60 would skew the results towards the external monitor, but not due to any TB1 bottleneck: The 60 fps limitation on the internal screen would be the culprit. The big loss is only when your use your Internal Display - if you use External Display Thunderbolt 1 is still GREAT! But that's the thing: I have no loss when running on the internal display (aside of a 60hz lock, which would happen with an external display too if I were to turn v-sync on with a 60hz external display). That doesn't agree with the other results I've been seeing, hence this post becomes interesting. Done. I've added the results to the previous post. Again, there is a tiny bit of loss related to the capping of the maximum FPS on the internal display, and this would not be there if I could cap the results on the external, or if I simply ran a GPU load that would not exceed 60 fps. Other than this, the results are pretty much identical. I start to think that with eGPU if we use better video card the more performance drop we will have, its not only about Thunderbolt 1, Thunderbolt 2 or Thunderbolt 3! Thanks Yukikaze. I'll follow this thread too now that I've found it. My own research suggests that with bidirectional (upstream + downstream) bandwidth, there's no clear reason Thunderbolt eGPUs would perform much worse on internal displays, especially at lower resolutions like 900p or 1080p. In other words, data driving the GPU is separate from data streaming back to the internal display. Many factors are often missed such as the 60fps cap on any Optimus-routed video. Overall, I believe misconceptions surrounding GPU bandwidth requirements have combined with these 60fps results reinforcing oversimplified notions like "half the PCIe lanes = half the Thunderbolt 3 bandwidth = half the fps in games". That'd be wrong and it's currently driving consumers and complicating the developing eGPU market. Actual testing (TechPowerUp) shows that even today's most power GTX 1080s rarely saturate 16GTps of PCIe. So I'm hoping we can gather and scrutinize more of these reports of limited bandwidth (e.g. x2 PCIe lanes) on internal displays. enjoy, I am going to reply here as well: The dependency is on the frame rate, not the GPU itself. The higher the frame rate goes, the worse the performance hit. However, if you goal is 60 fps gaming, all that means is you need to pick the correct eGPU for your monitor resolution. Running 100+ fps on the eGPU is not a feasible target, because the performance hit starts growing at this point. This means that choosing a GTX1080 for 1080p monitor is silly (it is also quite silly on the desktop too, to be honest, as a card for a third of the price will be quite sufficient). So yes the FPS is the main reason for performance drop, the more FPS we have the more performance drop we will have! I built a similar system: tinkpad t430s + thunder2 + ASUS 1050ti. In the graphics tests with the same settings I have similar results. Tell me what your GPU temperature during loading? I have in the test Unigine Heaven Benchmark 4.0, the GPU temperature reaches 80 degrees Celsius. To be honest, I haven't been tracking temperatures at all. The card does not seem to drop from its boost clock, so that would indicate it is not hitting 80c for me, but that's about all the info I have for now. Reshuffling some GPUs, so this thing got a GTX750Ti again. This time it is an EVGA GTX750Ti FTW I picked up for 50$. It is a very highly overclocked GTX750Ti (with an extra 6-pin connector) and I am actually very surprised at how well it performs still, especially since they can be found cheaply.